from grazing damage by geese," he said. He also claimed his landlord failed to provide adequate buildings or fencing. 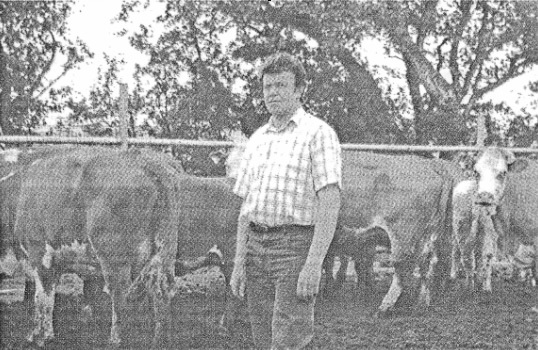 That, coupled with damage caused by the geese, forced him to sell off his flock of 130 ewes in 1990. "Now I have had to reduce the sucklers there is no way I can make a living here." Mr Quinn is claiming damages of more than £300,000 from his landlord for breaches of contract under the lease and £90,000 a year for loss of income. He is also claiming £250,000 from the Scottish Office for failing to provide him with a licence to shoot geese. "The local Department of Agriculture advised the Scottish Office in 1987 to issue a licence, yet it wasn't granted till 1994. Now it is too late and 80 acres of old meadows that were protected by a SSSI and the lease have been destroyed by geese damage," said Mr Quinn. On Tuesday Mr Quinn sold 52 cows for an average of £610. A DUMFRIES farmer is seeking compensation of £0.5m after over­grazing by geese forced him to cut his suckler herd from 124 cows to 40. Danny Quinn rents Powhillon Farm, Glencaple near Dumfries, from the Wildfowl and Wetlands Trust. The family had been ten­ants of the 116ha (286 acre) farm since 1916. The Trust acquired the farm in 1975. Acrimony between the Trust and Mr Quinn came to a head last November when a judge dismissed criminal charges against him for shooting protected Barnacle and Pinkfoot geese. The judge ruled that farmers had the right to pro­tect their crops from serious dam­age.